After butchering our deer, I ground up all of the meat from the front legs, the neck, and the ribcage. I left a bit of meat on the bones for Lucy, and saved back the hams and tenderloin to be cooked whole. We actually got quite a bit more meat than that since I wasn't very careful to pick the meat off the ribcage, but did pull off that meat to go in the stew after the bones had cooked down for a few hours. We also got one good liver and lots of bones for Lucy. I figure our gun has now paid for itself by bringing in over 57 pounds of meat. Over the last two years, we spent $200 on the gun, about $80 on a laser (which my 20/20 hindsight says would have been better spent on a scope), and about $70 on bullets for target practice. That's about $6 per pound, which isn't so bad for high quality free range meat. Once we kill a few more deer, the numbers will look even better, and since these deer were so easy to process, I suspect more will head to our freezer before long. Our DIY chicken waterer kits come with instructions for making a heated chicken waterer for easy winter care. I'd second the hindsight on the scope over the laser... Most lasers aren't really that good for daylight hours, unless you get a pretty high power one (>5 milliwatt green or something). One thing to keep in mind though... if you do add an inexpensive scope now, leave the laser on if possible and you will probably be able to see it in the scope. If you want some suggestions on scopes, let me know. There's a really really wide range of price and quality. I have spent more on some scopes than my guns... but with your carbine, I would think an inexpensive scope would suffice. It's not like you're going to be pulling 300+ yard shots with a 40 cal carbine. BeninMA --- I always wonder in cases like this whether it makes sense to kill your own (or make your own), so I like to keep track of the numbers. Oh... one more thing. Make sure that you securely mount the scope... I had a mid grade scope on a 30-06 for a while that would never ever hold zero from one trip to range to the next. Turns out that there was a little bit of protrusion on the aluminum casting which affected the way the scope mated up with the rifle. Cause me many many hours of frustration until I figured out what was going on. I ended up doing some machine work on the mounts and the replacement scope and mounts have been great since. IIRC your rifle will have picatinny rails on it, so should be less of an issue... but still make sure that you check for proper fit and probably use some removable locktite on the screws. If y'all end up with any questions, feel free to ask. I've got too much time and money in my guns. I'll bet Mark's gun friend has one of those --- he helped us with the sight of our current gun, I think. And we'll be sure to snug it up good! 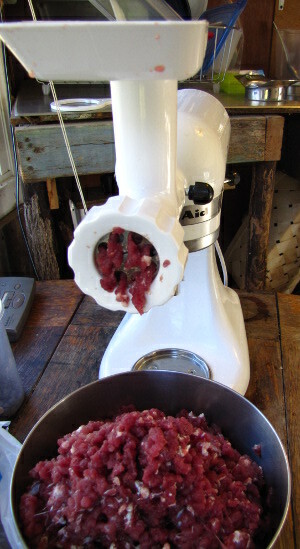 How much does a meat grinder like that one in the picture cost? I'm thinking about getting one, but can't decide which kind, etc. How well does it work and all? What I like about this meat grinder is that it fits onto my KitchenAid mixer (also a gift bought used.) The mixer has a PTO (well, that's what it would be called if it were a tractor... ), so the grinder itself is small and easy to store, and at the same time the mixer's heavy duty motor means it'll hopefully last our life time. If I wanted to, I could get all kinds of other attachments for the mixer to replace other kitchen gadgets, too. The only bit of trouble I had with the grinder was getting it to stay on the mixer. I suspect the problem is that the plastic housing on the grinder is slightly split from previous owners --- Mark's going to glue it for me. Otherwise, it worked like a charm. Very easy to feed in strips of meat --- the grinder pulls them right through the first time, and then I changed over to the smaller holes and had to push the meat through a bit with the included pushing stick. The meat came out looking like hamburger meat from the store --- very nicely ground. Looking on Amazon, I think that if you bought them new, the mixer would be $200 and the grinder would be $43. I haven't used other grinders, but I would definitely recommend this setup, especially if you use a mixer on a regular basis the way we do.